Scroll down to see our selection of Privacy Screens for sale. Privacy screens are used in facilities to provide coverage of a patient. We carry a wide selection of privacy screens for sale including wall mounted privacy screens, single panel privacy screens, three panel privacy screens, four panel privacy screens and five panel privacy screens with or without casters. What are privacy screens? 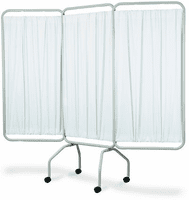 Privacy screens are devices used to separate a patient from the surrounding room. Privacy screens are portable and can be moved or stored easily. Coming in single, three, four and five panels, privacy screens can be used for multiple applications. Wall mounted privacy screens telescope in and out and can be folded flat against the wall to provide additional space. Privacy screens are a simple solution to your facility privacy needs..